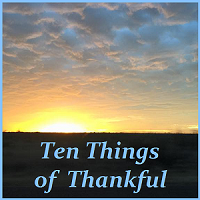 Welcome again to the blog hop that focuses on being thankful! Although we are fairly consistent on meeting weekly, after this week's link-up, we will take a break on December 21 and 28. Please take note of the things you are thankful for, though, and we will resume on January 4, 2019. I wish all of you a very merry Christmas season, and a happy New Year! For those of you arriving here before the link is open, I apologize. The Inlinkz site changed a bit, and I can't seem to edit for an earlier link-up starting time this week! Hopefully I'll figure it out before January 4th! Thanks for your patience with me. Happy December! I have a question for you: would you like to see the TToT continue the last two weeks of this month, or should we take a break on Dec. 21 and 28, and start again in the new year? Please comment below!